After one month and one day in limbo in the transit area of Moscow's Sheremetyevo Airport, former CIA employee Edward Snowden looks set to have finally settled on an ultimate destination in his search for political asylum - Russia. Conflicting reports have emerged throughout the day as to whether or not Snowden has received documents allowing the U.S. citizen, whose passport has been revoked, to cross the Russian border, but numerous officials today suggested a resolution is close at hand. Until then, the whistleblower still remains in the airport's transit zone. A source told Interfax that Russian Public Chamber commission head and lawyer Anatoly Kucherena had delivered a certificate from the Federal Migration Service (FMS) to Snowden in the Sheremetyevo transit zone. The document gives him the right to cross the Russian border, the source told Interfax. "They had a conversation. Kucherena handed over a set of documents to Snowden; it included a certificate that would enable him to leave the transit zone and to pass through Russian border control," the source said. However, the documents are not believed to be asylum permits, with Russian authorities under law having three months to make a decision on Snowden's application. Snowden has not been issued with a certificate that confirms the processing of his temporary asylum request, but this does not constitute a violation of the law, Kucherena said. "The law has not been broken because a Russian government resolution assigns up to three months for the processing of a request and this certificate is an internal document," Kucherena told reporters. "The certificate has not been issued because the request is still being processed," he said. Kucherena said he did not know when a decision granting temporary asylum to former CIA employee Edward Snowden might be made. Asked whether the process may take the whole three months, he said, "No, I think this will be done in the near future." "We are waiting. I speak to the Migration Service every day. As soon as a decision is made I will tell you about it," Kucherena told reporters. "As to how he is, he is more or less okay. He is looking forward to the solution of his problem. His mood is also more or less okay, normal, considering that he is practically being held under house arrest. So, let us cheer him up," Kucherena said. Kucherena explained the delay by citing the uniqueness of Snowden's situation. "This situation is unique for Russia and we must understand that. There have never been such cases or applications before. There is a certain procedure and the FMS is obliged to comply with it," Kucherena said. Kucherena confirmed that Snowden has been fingerprinted for the processing of his temporary asylum request. "Snowden has been fingerprinted. That has been done in my presence and I must say again that whenever such a request is made it cannot be simply written and mailed," Kucherena said. Snowden's ultimate choice had been seen as Latin America, with Nicaragua, Bolivia and Venezuela among the countries to officially extent asylum offers. However, Snowden does not intend to leave Russia, Kucherena announced. "Today the ultimate country of residence for him is Russia," Kucherena said in an interview with Russia 24. Permanent residence in Russia is Snowden's wish. Snowden "wants to find a job in Russia, he wants to travel and to build his life," the lawyer said. The press asked if Snowden had money to support himself. "I asked him that question. He said he did not have much but that it was enough to get started," Kucherena said. Kucherena said the runaway American "intends to remain in Russia." "He intends to study the Russian language and Russian culture," the lawyer said. Snowden has already learned several expressions in Russian and used them in his conversations with lawyer Anatoly Kucherena. "Talking to me today he said several words and phrases in Russian. He said 'Privet' (hi), he said 'Poka-poka' (bye-bye), and also 'Ya tebe pozvonyu' (I will call you)," Kucherena said. He reminded them that during their meeting he gave Snowden Dostoyevsky's Crime and Punishment and books by Chekhov. Snowden can theoretically expect naturalization in Russia after five years of legal residence in the country, Kucherena said. "He will have to live [here] for five years in order to be naturalized," he said. However, Kucherena said he had not yet discussed the issue of a Russian residence permit with Snowden. "This is not in question so far; the question is only about temporary asylum," Kucherena said. Snowden may work in Russia if he obtains temporary asylum. "Persons seeking refuge in Russia who obtain refugee status, political or temporary asylum, have an access to the domestic labor market. They may work without applying for a work permit," the Federal Migration Service website reports. The applicant is issued a certificate to confirm the processing of the asylum request. This document gives the applicant the right to stay in Russia during the request processing period. Snowden intends to meet the press after his position has been clarified, Kucherena told reporters. "Of course, he intends to meet the press when his position is finally clarified," he said. The lawyer added that Snowden contacts him and meets him on his own initiative. "I will not tell you the date because I see that in the media each is acting in his own way," Kucherena said. However, Snowden will not be contacting media representatives in the near future for security reasons, Kucherena said. "Before the question of his status is decided, he cannot do it today, of course, for security reasons," Kucherena said. He said Snowden asked media representatives to demonstrate understanding of his situation. He conveyed Snowden's words of gratitude to people who support him by sending him gifts. Earlier in the day, sources in airport services told Interfax that Snowden can now leave the transit zone of Sheremetyevo Airport. "Snowden possesses the necessary documents. No impediments are left to bar his departure from the transit zone and Sheremetyevo airport. He may freely move about Russia unless other restrictions are imposed on him," the source said. Other sources said Snowden has produced documents to border control. "Documents have been taken from Snowden, most probably, for border control registration," the source said. However, this was denied by a Russian Border Service source, who told Interfax Snowden will not be permitted to leave the transit zone of the Sheremetyevo airport just yet. "The FMS has not supplied the Border Service with the documents, which will enable him to go through border control. He cannot leave the transit zone just yet," the source said. Snowden has left the recreation room for personnel on duty at Moscow's Sheremetyevo Airport but still remains in the airport's transit area, another Sheremetyevo source told Interfax. "Passenger Snowden is no longer in the recreation room, he remains in the transit area. He has collected his personal belongings from this room," the source said. Kucherena confirmed Snowden remains in the transit zone of the Sheremetyevo airport for now. "He is staying in the transit zone in accordance with the law. He is acting precisely within the regulations' framework," Kucherena told reporters. "His living conditions are more or less normal. He is still wearing the shirt and jeans he was wearing when he arrived here," the lawyer said. "So, the money people are offering him - I know funds have been raised in Germany and in Russia as well - we will thank these people now and, after a decision about his status is made, Edward will decide what to do next," Kucherena said. Snowden fled to Hong Kong in May 2013 and then released classified information regarding U.S. special services' online surveillance activities. Following this, Snowden went to Moscow and has been in the transit area of Moscow's Sheremetyevo Airport since June 23. 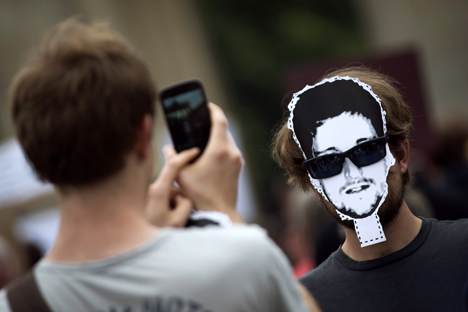 The United States revoked Snowden's passport and is seeking his extradition. Snowden officially applied for temporary asylum in Russia last week.